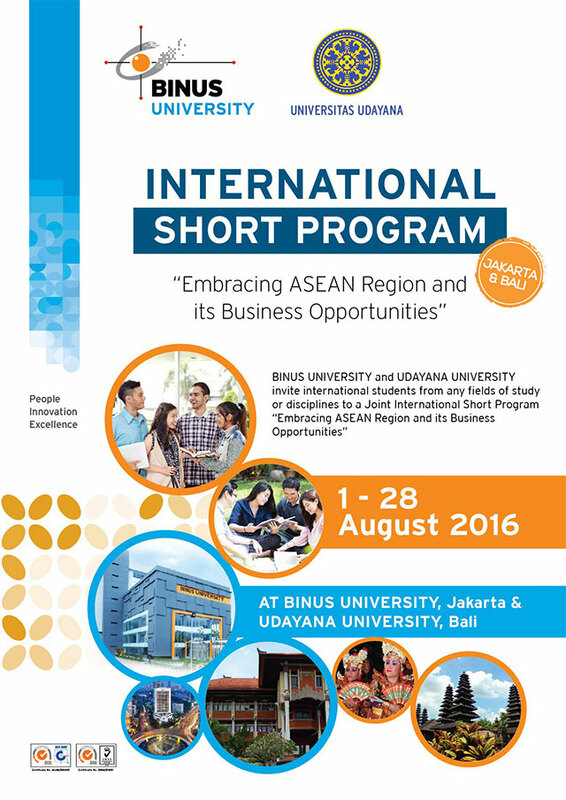 BINUS UNIVERSITY and UDAYANA UNIVERSITY invite international students from any fields of study or disciplines to a Joint International Short Program “Embracing ASEAN Region and its Business Opportunities” in Jakarta and Bali. Classes that cover the most important steps of Southeast Asia economic development. Students will be given a full overview of political, cultural, and economic history of ASEAN countries. The Joint International Short Program is open to minimum 10 participants. The program is conducted in English. The Joint International Short Program introduces students to the main areas of Business in ASEAN and Indonesian SMEs with ASEAN Expansion. The students will be able to discuss these topics with professionals from companies, institutions, BINUS UNIVERSITY and UDAYANA UNIVERSITY. You are an undergraduate student from any fields or disciplines. Applicants who wish to participate in the Short Program must apply by June 1, 2016. The selected participants will be notified within one week after the registration deadline. Payment should be made by July 1, 2016. If minimum number of participants is not achieved, program is canceled and fee will be refunded. Payment details will follow. Each participant will receive Certificate of Attendance and 8 (eight) credits.